Each November, the Gardens turns into a festive holiday shopping extravaganza at Winter Gift Market. One of the longest-running events at the Gardens, Winter Gift Market attracts dozens of artisans selling their wares and thousands of visitors looking to buy them. Though the vendors and products change every year, one of the most popular offerings at the Market remains the same: herb-infused vinegars produced by Denver Botanic Gardens Guild. 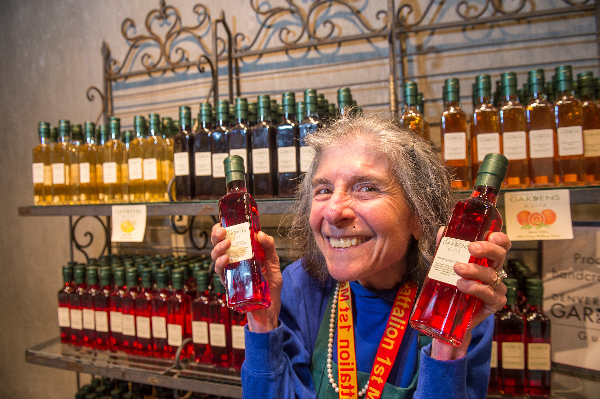 To learn a little more about how these jewel-tone vinegars are created, the special events team talked to two Guild members, Marilyn Anderson and Kris Persun, for some behind-the-scenes insights on their process. Q: How long has the Guild been making and selling vinegar? A: The Guild has been making herbal vinegars since the 1960s. Our first vinegar was the Herbal Blend, which we still make and sell today. Q: What makes the Guild vinegars special or unique, compared to other specialty vinegars at high-end grocery stores? A: Guild vinegars are unique because they are created almost entirely at Denver Botanic Gardens. The herbs we use are grown in the Gardens and are hand-picked by Guild members. The peppers for the Spicy Chili Pepper vinegar are grown at Chatfield Farms. We hold workshops at the Gardens where Guild members infuse and bottle the product. Then, the vinegars are sold exclusively at Winter Gift Market and in the Shop at the Gardens. Q: How long does it take to make the vinegar? A: The process is pretty lengthy! First, Guild members harvest fresh herbs from the herb gardens at York Street and Chatfield Farms. Next, herbs are washed and placed in gallon jars filled with white wine vinegar. These jars will sit for 4-6 weeks to infuse the vinegar with the herbs. Finally, when the infusing is complete, the vinegar is strained, bottled and sold to Gardens shoppers. Q: What are the most popular flavors of vinegar? A: It really varies year to year. Last year, we made 22 different varieties, and nearly all of them sold out. The most popular at last year’s Market were Basil Blend, Herbal Blend, Mango Ginger, Colorado Peach and Spicy Chili Pepper. Q: Are there any new flavors debuting at Winter Gift Market this year? A: This year, the Gloria Falkenberg Herb Garden had an abundance of many varieties of fragrant basils, so we’ve created several new basil vinegars: Genovese Basil, Crimson King Basil, Spicy Globe Basil, Green Pepper Basil, Lemon/Lime Basil and a Lettuce Leaf Basil. We’ll also feature a Thai Basil Ginger vinegar. Last year’s popular Basil Blend will also return, but it will be made from a blend of this year’s crops. Q: So, what is the Guild? A: The Guild is a service group within Denver Botanic Gardens volunteer program. Our activities include educational lectures, volunteering in the herb gardens at York Street and Chatfield Farms and making herbal products in workshops throughout the year. We also manage the herbs division at the annual Spring Plant Sale each May, and of course, we sell our herbal products and donated antiques at Winter Gift Market. We meet almost every month of the year for a combination of business, education and social activities. Q: What does it take to join the Guild or the vinegar committee? A: To join the Guild, there are annual dues and a 40-hour annual volunteer service requirement. Any Guild member can be on the vinegar committee, and there are many other committees to choose from as well. To learn more about joining the Guild, email vol@botanicgardens.org or call 720-865-3609. Stop by Winter Gift Market this Thursday, Friday and Saturday, Nov. 15-17, to find unique gifts for your loved ones this holiday season. Members receive 10 percent off all purchases! Learn more about Winter Gift Market.